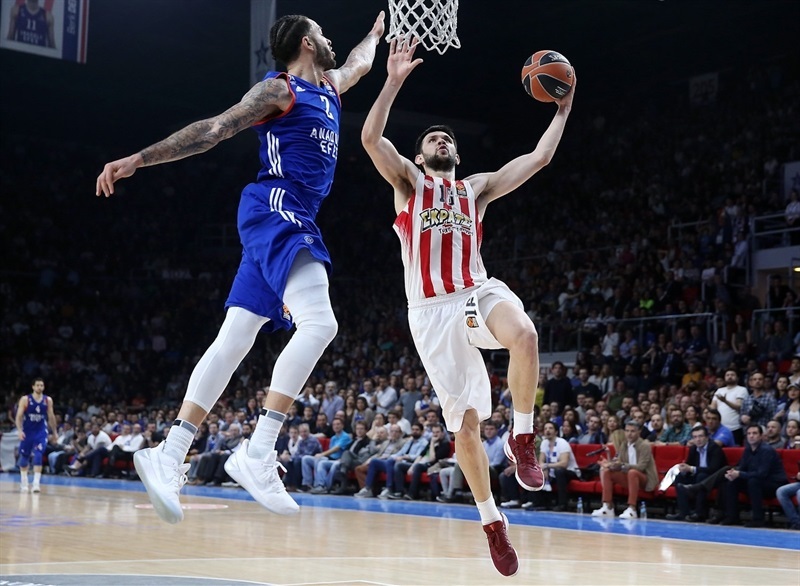 Olympiacos Piraeus survived on the road to set up a deciding Game 5 on its home floor by rallying from an early double-digit deficit to defeat Anadolu Efes Istanbul 62-74 on Friday night at Abdi Ipekci Arena in Istanbul. The Reds hits 12 three-pointers on the night, tying the series at 2-2 despite trailing 27-14 in the second quarter. But the visitors erased the deficit by halftime and then took the lead after the break by hitting 5 triples in the third quarter, before running away with victory with a defense that allowed only 4 points in the opening eight minutes of the fourth quarter. 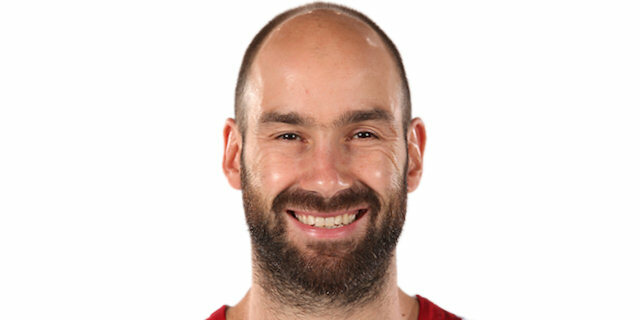 Vassilis Spanoulis paced Olympiacos and hit a number of clutch shots to finish the game with 18 points on 5-for-11 three-point shooting plus 4 assists. 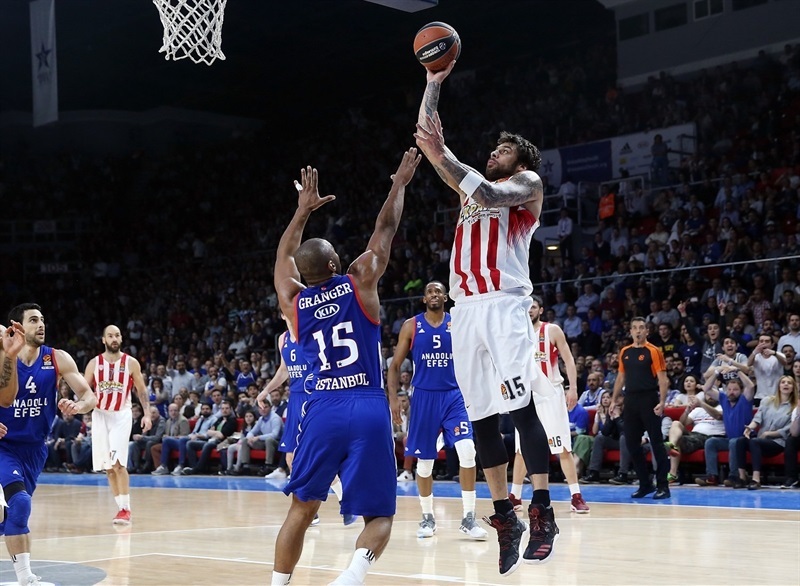 Georgios Printezis contributed 11 points and Erick Green netted 10. 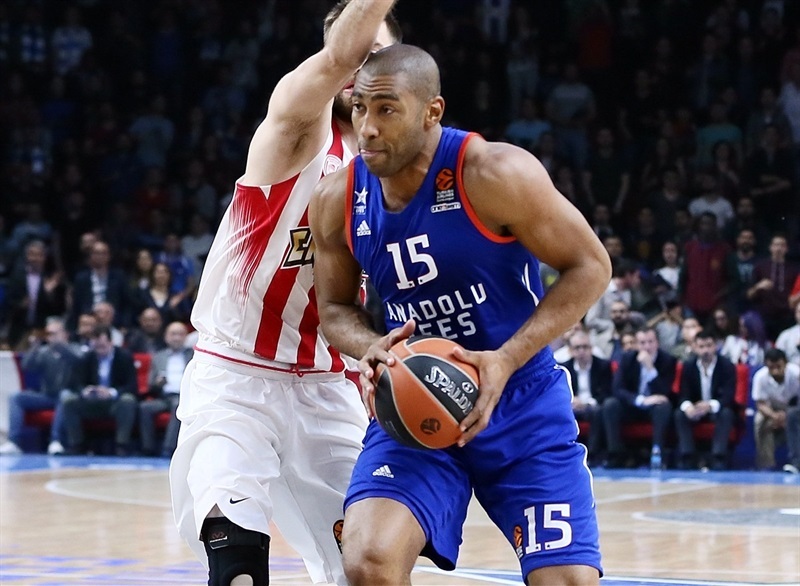 Jayson Granger scored 10 of his 17 points in the first quarter and was the only Efes scorer in double figures. Derick Brown added 9 points and Cedi Osman collected 8 points and 7 rebounds in defeat. 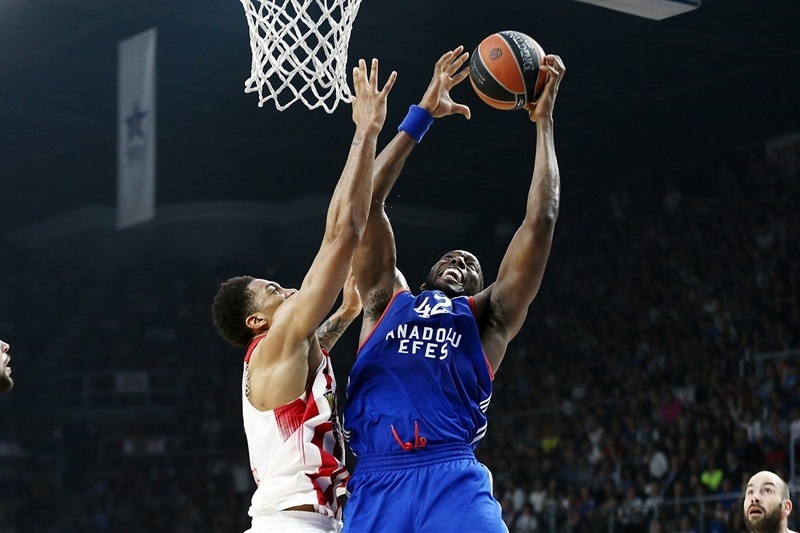 Efes had a strong opening to the game. Granger scored 10 points driving to the hoop and sinking a three-pointer and Osman finished a pair of fast breaks with big dunks to open an 18-6 lead. Printezis snapped a 12-0 run from close range and Ioannis Papapetrou hit one from long range to get Reds back in the game at 18-14. 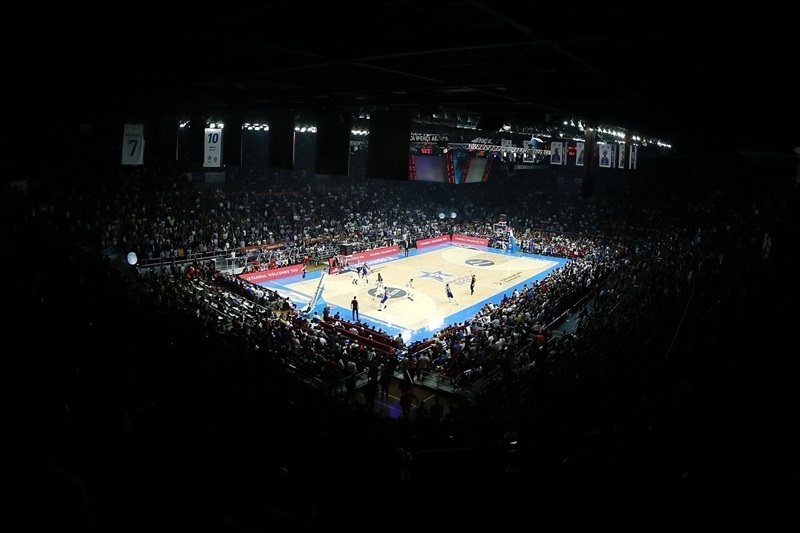 Efes led 21-14 after 10 minutes and the hosts scored the first 6 points of the second quarter, with Alex Kirk's mid-range jumper making it 27-14. 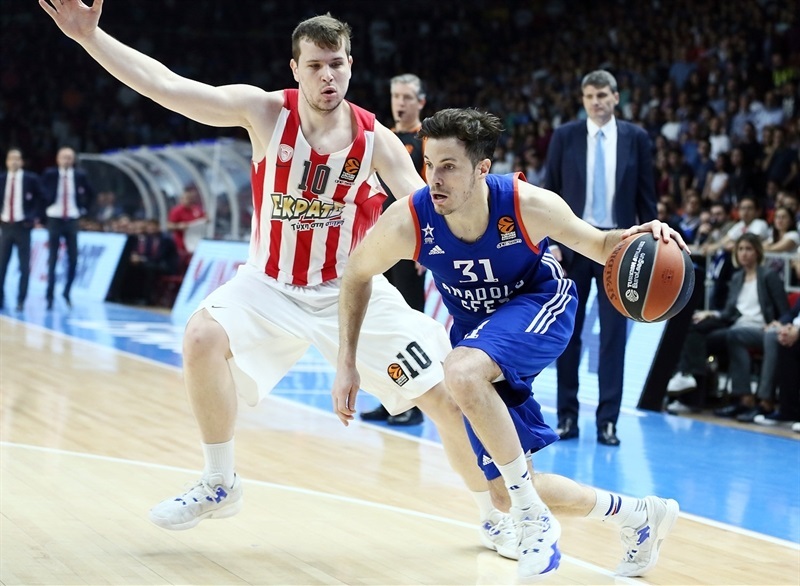 But Green and Kostas Papanikolaou gave Olympiacos a much-needed spark, feeling a 0-7 run during which Papanikolaou hit a triple. Each player added another basket before Green and Spanoulis hit back-to-back threes to cut the Olympiacos deficit to 36-35. Efes went into halftime up 38-35, but Olympiacos came out of locker rooms feeling it from long range. 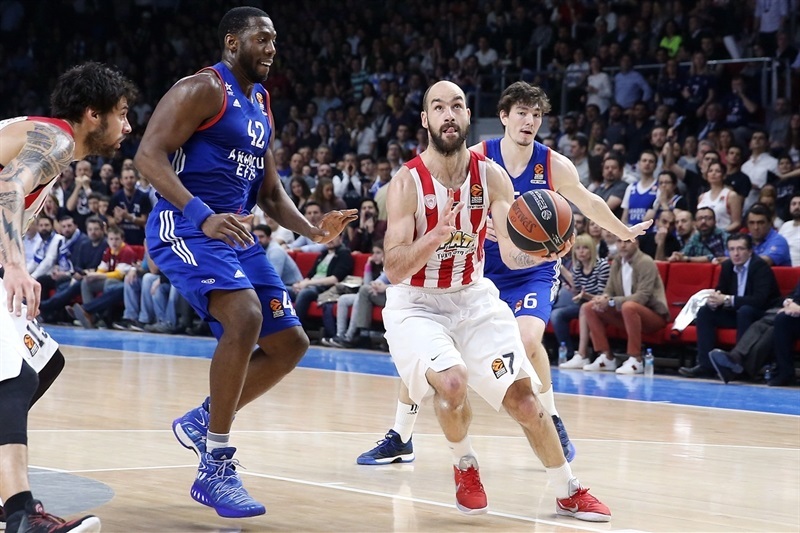 Vangelis Mantzaris, Spanoulis, Papanikolaou each hit a three-pointer to put Olympiacos in front 43-46. After Brown and Printezis traded threes, Spanoulis added another from downtown, his fourth, to open a 48-52 cushion. 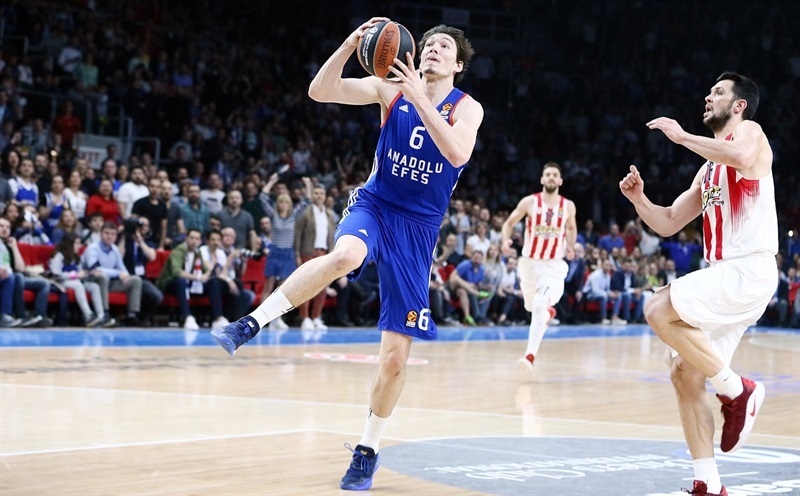 Heurtel scored a pair of layups, and Granger drove to the basket for Efes, too, but the visitors held a slim 54-55 lead going into the fourth quarter and never relinquished it. Papapetrou nailed a triple and Dominic Waters a jumper-plus-foul to make it 54-61. 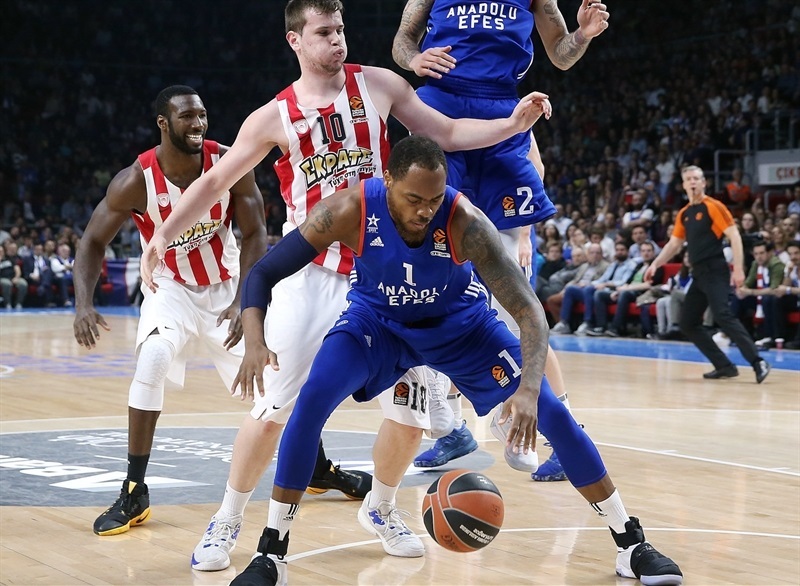 A put-back from DeShaun Thomas gave the hosts some hope, but Spanoulis drove to the basket for a layup with exactly five minutes to go, and after a timeout he hit his fifth triple to extend the margin to 57-68. 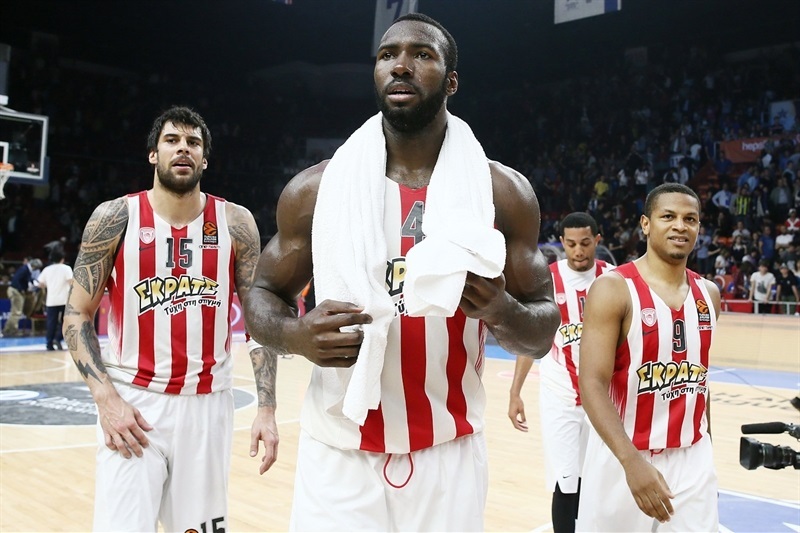 Olympiacos did not allow a single point for more than four minutes and Green’s corner triple made it 58-71 to secure the victory. 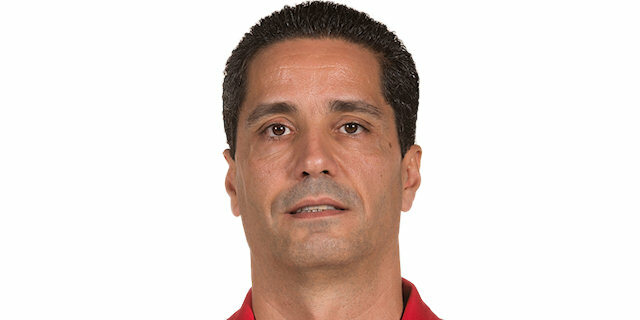 "Congratulations to Olympiacos, they deserved this victory. I think we started the game well, we had a good advantage, but they are a serious team and they caught up with us before halftime. I think the last quarter was when the game was decided. 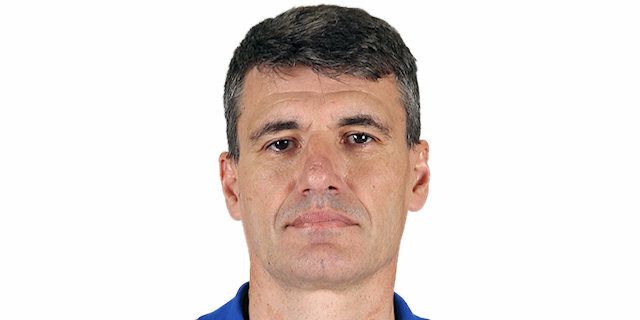 We played very bad on offense, without confidence, and after that, when you don’t score, it is very difficult to play defense like we did in the beginning of the game. We put hustle and energy, but all the games we have played in this series we had bad three-point percentages. It is very difficult to beat Olympiacos like that. Olympiacos finally stayed inside, did not allow us easy baskets. We had many open shots, but we did not score them." "It was a very important win for us. It was a game without tomorrow and I think we were very focused, determined to have a good game defensively and offensively. We did not lose our concentration in the crucial moment in the beginning of the game when Efes started really good, scored easy and with great rhythm, and got a 13-point lead. We reacted, and at halftime the difference was fair enough for both teams to continue to fight for the second half. In the second half, it was big fight, especially in the third quarter when both teams scored against each other, but in the fourth period I think with our great defense, we kept Efes in low scoring, allowing only 8 points, which was very important to dominate the game. With all this, I want to emphasize that series is at 2-2, and we still have one more game to play. To go to Final Four, you need three wins. Both teams will fight in Game 5, in our home court, and we need to continue to stay focused. In the last 48 hours our mental preparation was very important, to change the momentum from Game 3 to Game 4. " "It was a big win for our team. Last two games we did not play like we know how to play. We struggled a little bit defensively and offensively. Today we played really good, we showed character we played our game and got a big win. But nothing is finished, the series is tied 2-2, we need one more game. In all the years I played basketball, I always said that basketball is a team sport, the team wins, not the person. Everybody is important for our team, and especially in the series, you need all the players to be at a high level."